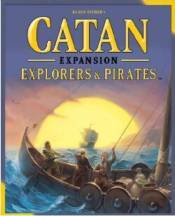 Take your Catan game over the horizon and discover a life of island adventure with Catan: Explorers & Pirates! The five scenarios in this set require you to master not one island but three and the sea as well! Explore and trade with ships designed to carry settlers, cargo, or adventurers. Settle new lands, battle pirates, acquire spices, and locate the grand banks of Catanian fish!